So many times, I work on projects that are rewrites of a currently working database system. The database has been used a number of years and it evolved with the needs of its users. The term that the database evolved is not be accident. Its growth may have been as organic in nature as the growth of a tree. Anyway, sometimes those databases I’ve been presented with in the past have gotten a little long in the tooth. They may have some (or a lot) of code that is not used anymore. In some cases, it may have unfinished code from previous enhancement endeavors that were never finished. This is the downside of using a database program that is so easy to work with, it can contain a lot of unfinished work if you are not careful. One thing that can help in the update of these types of solutions is to identify what fields the user really needs. One way to do that is to have the customer export them to you as a FileMaker table. In the export dialog box, you can pick and choose what fields will go out. So in this case, the client can cherry pick the fields they want to make sure are in the updated table. 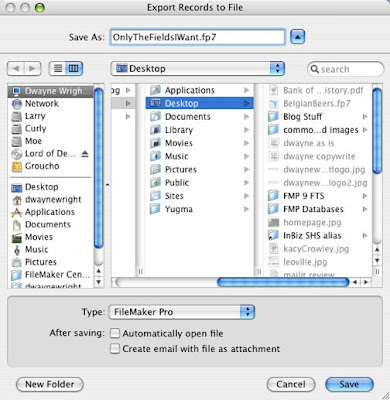 Exporting as a FileMaker table will export the data and the field schema in one shot. You can then use that exported file to make sure those fields and corresponding data are in the new solution. If you export in any format other than FileMaker, you won’t get the schema information like the calculations, auto enter or validation settings. With this exported table, you can quickly copy and past the table schema into a new file or a shell of a file you are wanting to use. For example, just this week I picked up a project in where a customer purchased my InBizness SOHO package. I’m then adding new tables to this package based upon what the client has said they wanted. This way, we can quickly integrate the best of the old and the new. Now you will want to look over these exported fields for broken calculations, including calculations that might be part of the auto enter or validation. You will need to bring over any needed value lists by hand and manually recreate your needed relational graph elements. In some cases, if you are bring over a whole table and you don’t rename the table, you can even copy layouts from one file to the next and the fields will stay mapped to their places on the pasted layout!